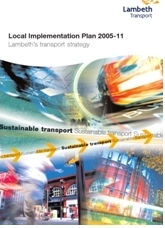 Lambeth’s Transport department has published the draft transport Local Implementation Plan which sets out’s the borough’s transport priorities and strategy for the next 10+ years within the context of the Mayor of London’s overall transport strategy. It also contains details of the funding priortities for transport projects for the next three years. We will be sending an offical Lambeth Cyclists response to the draft consultation document but wouild encourage all members to send in individual consultation responses too – the more pro-cycling responses received the greater the clout that cycling will have. Watch out for details of the LIP at our February meeting and on the email group. • Implementation of a 20mph speed limit on all Lambeth Roads to make them safer for all pedestrians and cyclists. • The introduction of ‘filtered permeability’. That is closing roads for local access only. As has been seen in parts of the borough where it has already been installed, this not only encourages cycling and walking but also removes rat running traffic leaving an area more pleasant to live in. Local politicians and others often oppose such measures because it is thought to increase congestion. TfL research indicates that as many as 50% of car jouneys across London are two miles or less – we feel that the LIP must play a key role in encouraging people to cycle or walk. The Corporation of London, responsible for administering transport in ‘the City’ has also released a LIP. The Corporation has traditionally paid little attention to cyclists only gradually implementing reforms to make the area more cycle friendly. The LIP currently out for consultation includes some signs of change to a more cycle friendly way of working which we want to encourage and develop. If you work in, or regularly cycle through, the City area please have a look at the Cyclists in the City blog at http://cyclelondoncity.blogspot.com where there is a summary of the proposals and a suggested response to the consultation.